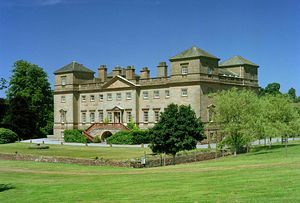 Hagley Hall and Park are among the supreme achievements of eighteenth-century English architecture and landscape gardening. They remain largely the creation of one man, George, 1st Lord Lyttelton (1709-73), secretary to Frederick, Prince of Wales, poet and man of letters and briefly Chancellor of the Exchequer. Before the death of his father in 1751, he began to landscape the grounds in the new "picturesque" style, and between 1756 and 1760 it was he who was responsible for the building of the house as it is seen today. On Christmas Eve 1925, a disastrous fire swept through the house destroying much of the Library and many of the pictures. Despite boiling lead pouring from the roof through the house, all those within managed to escape. At the height of the blaze when nothing more could be salvaged from inside, the 9th Viscount was heard to mutter "my life's work destroyed". It was thus to universal amazement that he and his wife lovingly and painstakingly restored the house, complete, save for the staff quarters on the top floor. There has been a Park at Hagley since the reign of Edward III but the present outstanding landscape was created between 1747 and 1758, with follies designed by Lord Camelford, Thomas Pitt of Encombe, Henry Keene, James "Athenian" Stuart, and Sanderson Miller. Horace Walpole, notoriously hard to please, wrote after a visit in 1753, "I wore out my eyes with gazing, my feet with climbing, and my tongue and vocabulary with commending". Hagley Hall, with its rich Rococo decoration surrounded by picturesque parkland, is a remarkable tribute to the artistic achievements of the great eighteenth-century amateurs, but still remains a much loved family home. Take A491 signposted Stourbridge. Follow A491, at second roundabout (Hagley) take fourth exit signposted to Hagley Hall.